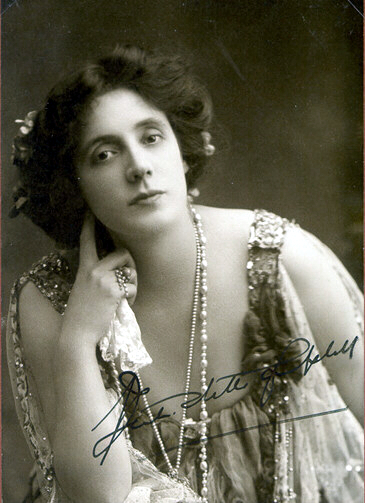 Campbell, Mrs. Patrick (Beatrice Stella Tanner) (1865-1940): Made her debut in 1888, four years after her marriage. "Mrs. Pat" appeared at the Adelphi in March 1890 at a matinee when she played Helen in Knowles' The Hunchback. Next season, she played Lady Teazle, also at a matinee. Photographed in the United States pre-1897; Philip H. Ward Collection of Theatrical Images (1856-1910).